Nvidia's launch of its Tegra processors makes World War Mobile official, with multiple major players cramming serious juice into tiny, ultra efficient chips for a range of mobile devices. Nvidia is calling Tegra "the world's first computer on a chip for mobile visual computers" which squeezes a CPU, GPU, system memory and more onto a dime-sized chip that Nvidia says is 10x more efficient than the competition, with up to 30 hours of HD video playback (WSJ says 26) on a single battery charge. It's for so-called mobile internet devices that fall between smartphones and subnotebooks (like Nokia's N810), so it's taking on the lowest end of Intel's Atom chips, though we'll have to see how it fares head-to-head. Subnotebook vs. UMPC vs. Netbook: WTF Is the Difference? SANTA CLARA, CA-JUNE 2, 2008-Today, NVIDIA brings visual computing to mobile internet devices (MID) with the launch of NVIDIA® Tegra™, a family of highly integrated computers on a chip. In addition to MIDs, the NVIDIA Tegra 650 and 600 processors will be used in a wide range of innovative platforms such as embedded PCs, web tablets and more. 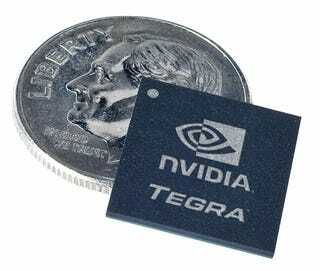 The NVIDIA Tegra 650 processor is the world's first computer on a chip for mobile visual computers. NVIDIA Tegra features a GPU, media processor, system memory, peripherals and a CPU all in one ultra-low power chip, smaller than a US dime (10-cent piece). The NVIDIA Tegra 650 processor is the second product in the Tegra line, the first being the NVIDIA Tegra APX 2500 processor, which is enabling the next generation of Windows Mobile smartphones. "With the growing market demand for mobile Internet access, NVIDIA launched the APX 2500 computer-on-a-chip targeted at smartphones and handsets earlier this year. Recognizing that mobile Internet access usages will occur not just on smartphones and handsets but on compute devices as well, NVIDIA announced today their Tegra product line. Representing the first products to be targeted at the MID and portable device space, it is anticipated to bring integrated capabilities similar to the APX 2500 with NVIDIA's graphics expertise, an ARM core, HD video,and advanced power management," said Ian Lao, senior analyst at In-Stat. This new processor features an optimized combination of an ultra-low power GeForce® GPU and an 800 MHz embedded ARM CPU, Due to their highly integrated design, NVIDIA Tegra processors achieve up to 10 times the power efficiency of existing products in battery-operated computer systems running compelling visual computing applications. this challenge more effectively than any other solution yet on the market, thereby taking a major step toward the oncoming mobile Internet revolution." "With NVIDIA's Tegra processor line, we will continue to see impressive mobile innovations in Windows Mobile products," said Todd Warren, corporate vice president of Microsoft's mobile communication business. "Microsoft is dedicated to providing people best-in-class mobile experiences, so that people can carry a single device for work and play."